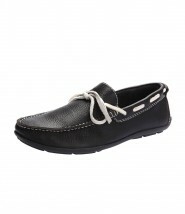 Loafer’s shoes give your feet comfort for a whole day’s work, and exude style that takes you into the realm of formal. Loafers began their journey in Norway. Norwegian farmers wore these low cut shoes to protect their feet while feeding cows in ‘cattle loafing areas’. Esquire magazine’s photograph of Norwegian farmers led the design department of the Spaulding family towards this shoe. Spaulding’s chose the name ‘Loafer’ for the casual, flat slip-ons. In 1934, boot maker GH Bass introduced the modern day incarnations of men’s loafers. From Norway to the rest of Europe and from there to the US, and then on becoming a global phenomenon, it has been a long a journey for this casual style. Bass called his loafers ‘Weejuns’ and added the modern design of a strip across the vamp with a diamond cut. Shoe stylists soon began to use the cut out for embellishments, especially pennies. That’s the story of penny loafers! Though brown is the most popular hue for this casual shoe, you can buy men’s loafers online in tan, black, green and even red. Surf through our online shop to pick colors that are classic, classy as well as contemporary.